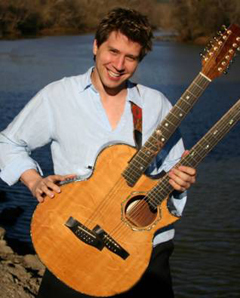 BLACKSBURG, Va., April 9, 2010 – As part of its Lively Art Series, the Virginia Tech Union is bringing guitarist Dominic Gaudious to Virginia Tech on Monday, April 12. The doors for the show will open at 7 p.m. and the event begins at 7:30 p.m. The concert will be in Burruss Hall. The event is open to the public with student tickets priced at $7 and non-student tickets priced at $20. Tickets are sold through the University Unions ticket office, online, or in person on the first floor of Squires Student Center. In the 1980s, Gaudious successfully toured with an electric rock band, but found his passion in the contemplative world of classical and world beat music. Gaudious works mainly with six- and 12-string acoustic guitars while incorporating exotic instruments such as the Australian didgeridoo. He has a unique and intricate playing style, blending the sounds of classical, jazz, flamenco, rock, and world beat. Written by Katie Noland. Noland, a senior from Berryville, Va., is majoring in English in the College of Liberal Arts and Human Sciences.